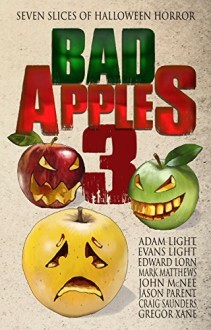 The Bad Apples crew is back with its biggest Halloween anthology yet! * On Halloween night, an artist intends to use humanity as his canvas, to mold flesh into his greatest masterpiece. In Adam and Evans Light's BELLE SOUFFRANCE, suffering has never been so beautiful. * Everyone knows you are what you eat. So Cam probably shouldn't munch on those chocolate eyeballs he stole. Sins of the past are only one bite away in John McNee's CHOCOLATE COVERED EYEBALL. * Halloween comes once a year for most people. Unfortunately for Harvey, it might be coming around a little more often in Craig Saunders' OCTOBER'S END. * The girl behind the counter at the local costume shop reads horror novels and only horror novels. She's perfect. And she's hosting an intimate Halloween get-together in Gregor Xane's THE UNCLE TAFFY'S GIRL. * Charli is usually lonely, but tonight she's on a bus headed to a party where she hopes the man of her dreams might finally notice her. But when a masked man enters the bus, it'll be the ride not the party she never forgets in Edward Lorn's LAST STOP. * Christians say Halloween is a pagan holiday, and Keagan's mother doesn't think Jesus would approve of celebrating it. Little does she realize that they're about to find out if that's true from Jesus himself in Mark Matthews' BODY OF CHRIST. * Any cornfield Halloween party filled with teenagers dressed like iconic horror villains is bound to end with murder and mayhem. But when a grim reaper throws in a twist, the killing really gets out of hand in Jason Parent's PULP.